Incoterms 2010 is adhered to by all major trading nations of the world, and it is the authoritative text for determining how costs and risks are allocated to parties conducting international transactions. Incoterms facilitate the conduct of international business by defining the responsibilities of the involved participants. Today, we’re discussing the Incoterm FAS, also known as Free Alongside Ship. download the free chart of responsibilities. 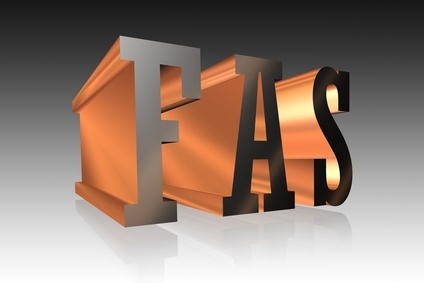 What Does the FAS Trade Term Mean? FAS means the seller delivers when the goods are placed alongside the vessel (for example, on a quay or a barge) nominated by the buyer at the named port of shipment. The full text of the 2010 edition of the Incoterms rules is available at the ICC Store. When Can FAS Be Used? FAS can be used for sea and inland waterway transport. With FAS, risk transfers to the buyer when the goods are alongside the ship, and the buyer bears costs from that point forward. Shipping Solutions export software can help you streamline the process of recording which Incoterms version you’re using and make sure your documentation is correct throughout the transaction. Try it for free today!